We’ve been told that we can’t judge a book by its cover, yet we do it all the time. A good cover can catch our eye and attract our interest. The art and title alone can usually tell us whether it’s gritty sword and sorcery, epic fantasy, or paranormal romance. The cover tells us more about the setting and mood of the story than even the jacket copy, and continues to influence us even after we start reading. And unfortunately, self-published authors usually lack the budget and the specialized skills to do a great cover. Often, self-published covers look amateurish. Some authors decide to forgo a cover altogether, deciding that it’s better to have no cover than a bad cover (my wife takes this approach). This month’s novel, Avarice by Annie Bellet, is a notable exception. It’s not just that the cover is beautiful in itself, it’s that it instantly tells you what the story is about. 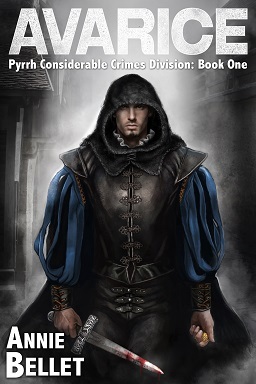 Between the illustration and the title of the series (Pyrrh Considerable Crimes Division) an experienced reader of genre fiction has a pretty good idea what this book is about. I’ll give you a moment to guess before I reveal the answer below the fold. If you guessed police procedural in a fantasy city, give yourself a prize (make it a book). Think Law and Order in Renaissance London, with a dash of magic and cat-people for good measure. Pyrrh is a bustling city, where the cat-like Kirgani and scaly anuran rub shoulders with humans. The human Par is a Cordonate in the Considerable Crimes Division, which deals with murders and other high crimes. Having recently lost his partner, Par is more than a little on edge, and it doesn’t help that he’s hiding a life and death secret. But while Par gets top billing in the book description, his new partner, a Kirgani named Zhivana, is the real lead, and most of the story is from her point of view. Par’s and Zhivana’s first case together has them investigating the murder of a young alchemist in the office of the Treasury, which, needless to say, is more than it at first seems. While the setting has what appears to be Renaissance-level technology, the society and attitudes don’t really fit the time period. Of course, that’s true of a lot of fantasy, sometimes with the excuse that any sufficiently advanced magic is indistinguishable from technology, and sometimes not. Here the effect is much more deliberate. The CCD feels much more like a modern police department than a Renaissance city watch, down to its bureaucracy and acronyms. There are medical examiners who perform autopsies, officers who take notes during interviews and file reports, rules for how long prisoners can be held and how they can be questioned, et cetera. The advantage is that it’s all very familiar to us, and makes for very engaging reading, especially when the Cordonates face the same constraints that modern detectives do, but with none of the advantages of modern technology and criminal investigation techniques. However, it does make the suspension of disbelief a little bit harder. It’s easy to wonder how successful such a system of justice would be. Then again, the same difficulties would have challenged the likes of Sherlock Holmes, who would have faced similar limits in science and society. Once I was able to accept (or at least rationalize) the anachronisms, I had a much easier time enjoying the story. And it was enjoyable. The novel is well-written and the pacing tight, moments of introspection and excitement appearing exactly where they were needed. The weakest part was that the Cordonates were sometimes a bit slower than I was in working out key clues. It’s a difficult balance, between giving the reader enough information that he feels like he’s solving the mystery himself, while making sure your detectives still have a chance to be brilliant, but it’s an important one for a mystery writer to achieve, and I thought that Ms. Bellet didn’t quite manage it. I do give her credit for avoiding the ending explanation so common in the genre, where everything is clearly explained to the reader in the last scene. However, this did leave the full extent of the plot ambiguous. There were enough pieces revealed to know who the culprit is, but I was left with some uncertainty as to the how. Avarice is available at Amazon (print, Kindle, and audiobook), Barnes&Noble, DriveThruFiction, Kobo, and Smashwords. If you have a book you’d like me to review, please follow the submission guidelines here.